As snow season is upon us once again in many parts of the country and the hatches have already been battened down, but some of you may have concerns if your shed will tolerate a heavy snow load over the winter months. In this article we take a look at some symptoms of heavy snow load and options to deal with them. If you bought a budget shed in your local super store for a couple of hundred dollars, chances are, I have to say it; you will get what you paid for. Many of these sheds are re branded foreign imports. 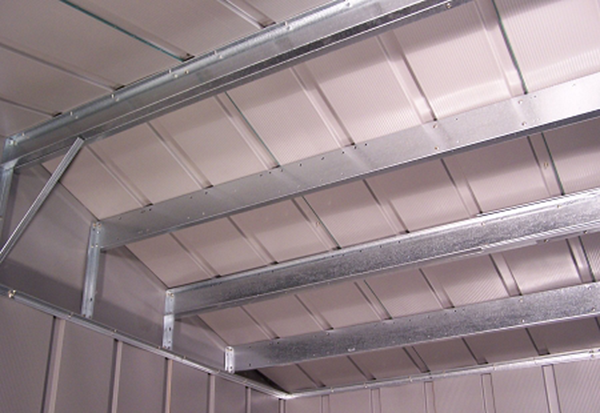 They are usually made of light gauge metal and often with light metal roof structures with minimum supports holding up the roof panels. Light metal is cheaper to ship overseas, hence a cheap shed is what you get, period. They will look fine in summer but after a long hard winter, will they stand up to the heavy winter snow? I doubt it. In general when you spend a little more on tried and tested US brands they will have a pretty solid roof structure and you will unlikely need any extra roof strengthening support. The worst that can happen is that a heavy snow load will push down your roof and cause the roof panels to bend or warp and eventually cause your shed to take in water and make it pretty much useless when it comes to keeping your contents snug and dry. Obviously this is something you want to avoid at all costs. For the most part this is unlikely to happen when you buy a decent quality shed. 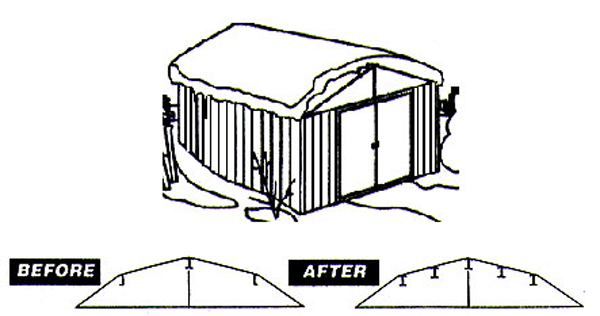 That said several US shed companies provide roof strengthening support kits which are designed just for this job and provide a pretty good preventive measure when it comes to protecting your shed against extra weight with snow load. Arrow Sheds who mainly make Metal Sheds and a premium Vinyl Coated Metal Sheds have a simple solution that will take care of this issue. The kit simply consists of extra beams that run the length of your shed from gable to gable. They get inserted at closer intervals thus beefing up your roof as seen in image below. When installed correctly you should never have to worry about snow load for the whole winter as your shed roof will be as strong as a house so to speak. Duramax Vinyl Sheds generally already have a strong roof structure but they do provide a truss system roof strengthening kit that is designed to fit in all their 10ft wide vinyl garages which will ensure a stronger roof structure. This is simply an extra roof truss that can be inserted in between two existing roof trusses which will prevent any sagging of vinyl roof panels during heavy snow loads. In general their smaller sheds will not need it as seen here are already well supported. Both Arrow and Duramax Metal Garage Kits already have a pretty solid roof structure that will handle snow loads up to 20lb/sq foot. It is unlikely you will need to add extra beams to these Metal Garage Kits. At storage sheds direct we carry a full range of both these brands and all of their available accessories to ensure your shed stays put this winter. StorageShedsDirect.com is a nationwide supplier and storage building consultant for all your outdoor storage needs. I live in area where the building code requires a snow load tolerance of 65 lbs/sq. ft. We average 160 inches of snow (often wet snow) per year and have had up to 326 inches in a single year. The reinforcing kits that you describe don’t even come close to meeting code requirements here. Any suggestions? I see from your website, that Duramax sheds have roof strengthening kit. Could you please tell me what the rating for the roof would be once it was added to the Woodbridge 10 x 8? ( my understanding is that it comes with a 20 psf)My city requires a 30 psf rating because of the snow fall in this area. Also, could you please e-mail me the complete specification sheet for this shed? Do you have another recommended vinyl shed that would come with a 30 psf rating without a roof strengthening kit?